As a promising young photographer in the US who had won the prestigious National Endowment for the Arts award, in 1980, and was already represented in major collections like the San Francisco Museum of Modern Art, David Stephenson’s relocation from USA to Tasmania in 1982 might appear unusual. Yet, as Daniel Palmer has noted, Stephenson was ‘always drawn to the fringes of the human world’1 where he could fully explore the central theme that has always governed his practice, namely ‘the relationship between humans and the environment’2. Throughout the 1980s and 90s the photographer sought to not simply document the volatile and often destructive impact of this relationship, but also find the philosophical dimension of the binaries that separate us from but also, inextricably tie us to nature. His search for the most eloquent forms of expression has led Stephenson to the serial format and a coolly detached outlook that does not overstress the drama yet resonates with an undeniable emotional charge. ‘The ‘Zinc Works’ and Mount Wellington from Store Point, Tasmania’ 2004 belongs to an ongoing investigation of the environmental impact of industrial processes in Tasmania. 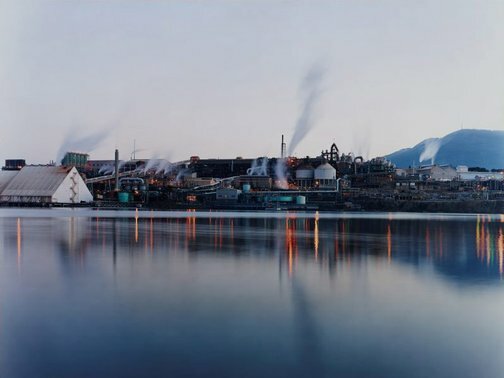 Along with the other images from the series ‘Marking time’ 2003-2005, it is a finely rendered statement about the irreversible marks left by human settlement and exploitation of natural resources for commercial purposes. The unflinching directness of these images renders them into some of the most politicised in Stephenson’s oeuvre. As such, they represent a significant shift from the metaphysical enquiries into the sublime that typify the trajectory of Stephenson’s 1990s series such as ‘The Ice’ 1991-92, ‘Stars’ 1995-1996 and ‘Domes’ 1993-2000. Furthermore, the experiments with long exposure and twilight photography in ‘The ‘Zinc Works’ and Mount Wellington…’ directly led to Stephenson’s latest body of work, the series ‘Light cities’ 2010, which has also opened a new thematic terrain for the artist – the urban landscape. Stephenson is not a polemicist and always retains his meditative stance on the nature of humanity. As a master of reduction and editing he avoids any superfluous, didactic detail, constantly striving to maximize the potency of the visual field by engaging the imagination and the agency of the viewer. Thus his photographs tend to take us beyond the materiality of the image and lead to an engagement with the philosophical truth of the subject. Signed and dated label u.r. verso frame, ink "David Stephenson 2004". In the balance: art for a changing world , 2010, 139 (illus.). Tidal 04: City of Devonport Art Award , 2004, 16 (illus. ).